We offer Same Day Bee Hive Removal Services. We specialize in Bee Removal and Bee Control. Dont Let Bees take over your property, Call Today. 1-844-305-8999. We will remove any Beehive or any other Stinging Insect Hive or Nest. 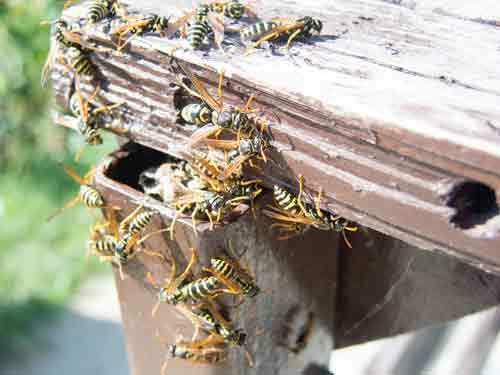 Bee swarms initially enter walls through some small crack or opening. A broken spot in the mortar, an opening around a light, faucet or electrical meter, or a gap between the brick and the siding on a house or building makes an excellent entrance site for a swarm of bees looking for a home. Once inside the wall, the bees quickly build a hive. The type of treatment can vary from quick acting knockdown pesticide spray to long lasting residual insecticide dust. The long-lasting insecticide dust is applied into the openings that the bees used to enter their hive. The insecticide dust penetrates deeper into the Bee Nest, than an ordinary pesticide spray would. Additionally, the dust is transported deeper into the hive by other bees entering. This will allow our Stinging Insect Exterminator to perform the Bee Removal in a safe manor. It's not a good idea to attempt to remove a bee infestation by yourself. Nests and colonies of stinging insects may contain thousands of individual members. If you, your kids or your pets get too close, it's possible that the insects may react defensively, leading to painful stings. Allergic individuals can have life-threatening reactions to these stings. Making it all the more important to call in our professional bee exterminators the moment you spot a gathering of bees too close to your home or business for comfort. When Stinging Insects have invaded your home and you need a bee exterminator, contact us at Dependable Exterminating 1-844-305-8999. We'll give you a free quote and have your bee problem cleared up in no time. Female carpenter bees bore holes into wood to build nests. Unlike termites, carpenter bees do not eat wood. The damage they cause comes from tunneling into wood to create nesting chambers. 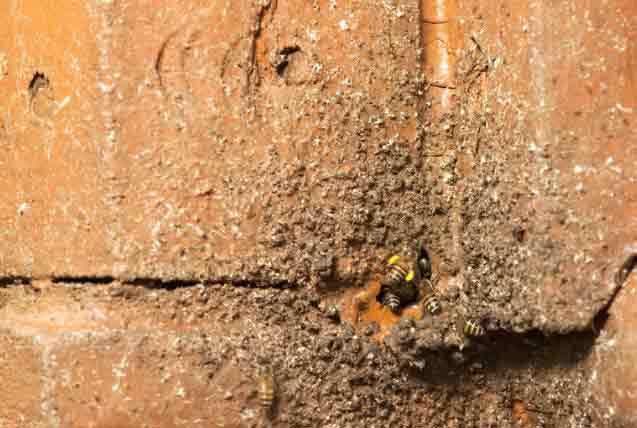 The bees bore entry holes about 1 inch deep into their targeted structure. If you have an infestation of carpenter bees, you may notice these holes on wooden decks, wood underneath the home, and other wooden structures on your property. If you notice you have Carpenter Bees, Give Us A Call @ 1-844-305-8999. 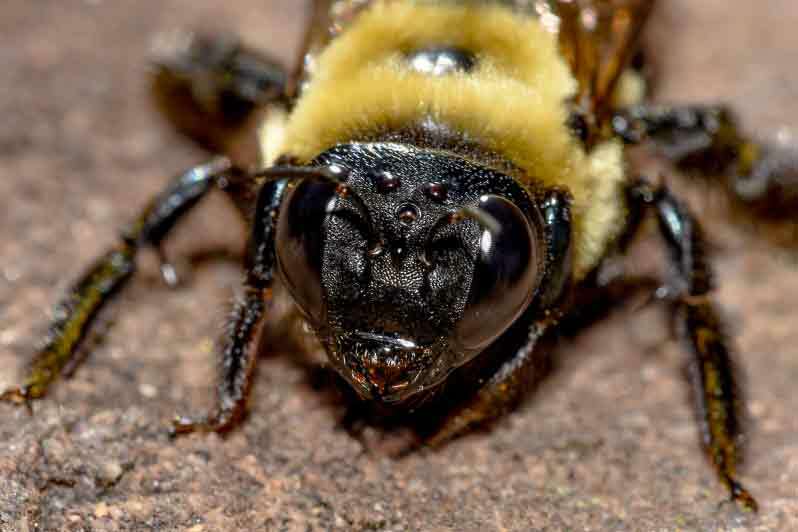 Our Bee Exterminator will treat the infested area with residual insecticide and Insecticide Dust to eliminate the Carpenter Bees from your property. Our Stinging Insect Technician will do a Thorough Inspection of your Home and Property and remove any Hornet Nest you may have. If the Bee Hive is found inside your home we will perform a Treat and Seal (Remove the Bee Hive, Seal Openings). - An initial inspection and treatment.